This extensively updated second edition was created for medical device, medical packaging, and food packaging design engineers, material product technical support, and research/development personnel. 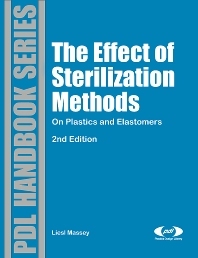 This comprehensive databook contains important characteristics and properties data on the effects of sterilization methods on plastics and elastomers. It provides a ready reference for comparing materials in the same family as well as materials in different families. Data is presented on 43 major plastic and elastomer packaging materials, including biodegradable or organic polymers. New to this edition are resin chapters containing textual summary information including: category; general description; applications; resistances to particular sterilization methods; and regulatory status considerations for use in medical devices and medical/food packaging. The resin chapter material supplier trade name product data is presented in graphical and tabular format, with results normalized to SI units, retaining the familiar format of the best selling first edition and allowing easy comparison between materials and test conditions. Medical device, medical packaging, and food packaging design engineers, material product technical support, and research/development personnel.